Redland Art Gallery, Cleveland has sent the official number of star weave communities participating in the One Million Stars to End Violence project to 100, representing a major milestone for the project which started in 2012 in response to the escalating occurrence of racial, domestic and family violence in Australia. Brisbane artist Maryann Talia Pau’s said the response to the request for help in achieving her goal of weaving one million stars by July 2017 for an installation at the Gold Coast 2018 Commonwealth Games (GC2018) had been outstanding. “Each of the 100 star weave communities who have signed on to help me achieve one million stars has a goal of weaving 10,000 stars each – an incredible collective statement against ending all forms of violence and a commitment to show how much can be achieved when we work together as a community,” said Maryann. Speaking from the CATCHING light installation at the Redland Art Gallery, Cleveland, Maryann said her goal to weave one million stars by July 2017 was fast becoming a reality. “I’m so excited to be here at Redlands to not only launch this beautiful installation of 5000 stars, but to celebrate Redlands Art Gallery being the 100th star weave community to weave 10,000 stars by July 2017,” said Maryann. “It’s been incredible to meet the passionate people here tonight, from all over Australia and across the world who are so supportive of this project and what we are trying to achieve. Redland City Mayor Karen Williams said as a City we have pledged our commitment to stamp out violence in our community and becoming the one hundredth star weaving community was the perfect way to reinforce that commitment. “We are eager to support One Million Stars and our local resident Maryann to raise important awareness of issues in our society about domestic violence, racism, bullying and all forms of violence,” Cr Williams said. Cr Williams said Redland City was honoured to be the one hundredth star weave community and she encourage all residents to become a ‘superstar’ by weaving as many stars as possible to help the Redlands become one of the largest Star Weave communities. 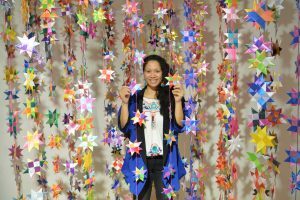 “Let’s make it our aim to weave 100,000 stars by December 2016 for a display at Redland Performing Arts Centre in February 2017 to show our commitment as a community to end violence”, Cr Williams said. Redlanders can get involved in the project by visiting the Redland Art Gallery, Cleveland during 31 July to 4 September 2016 to view the CATCHING Light installation, learn how to weave a star or drop off your stars for counting. Individuals, groups and communities are needed to weave and contribute stars by July 2017, to be used in a one million star installation at GC2018. Star Weave Solo – weave stars yourself in the comfort of your own home. Star Weave Jam – host a Star Weave Jam workshop by gathering friends, family, neighbours and colleagues in your home, studio or workplace. Star Weave Community – start a Star Weave Community and coordinate your local community to weave 10,000 stars by July 2017. For more information visit One Million Stars.